Wow! There is a lot of vacation planning going on. We are spending everyday booking rafting trips on the Gallatin River and lots of Adentur Packages too. The package deals are our favorite, what a fun day to go rafting, have lunch and then do a zipline or adventure package. I think these are our most popular adventures in Big Sky for two reasons. Not only is the value of the trip very budget friendly but it's so easy to fill a day with fun and adventure with only one phone call or an easy online reservation. We never know what to expect for weather this far ahead but we can tell you that we have the most snow in the Rocky Mountains, last we checked about 20% above average of most years. That translates into beautiful summers with excellent rafting conditions on the Gallatin river here in Big Sky, Montana. An abundance of snow means fewer forest fires late in the summer and that's always a bonus! Our most commonly reserved adventures are the Gallatin River Rafting Trips in Big Sky and the Zipline Adventure Park in West Yellowstone. Both of these activities are included in the Yellowstone EPIC Pass. This all inclusive pass gives you access to a weeks worth of activities with one call. Don't miss it! If you are staying in West Yellowstone or Big Sky Montana this is a no brainer for saving a ton of money! Best water levels in years and fantastic weather are making for some of the best rafting we've had lately! Join us for a rafting trip, we have trips available everyday all day usually at 9:30 , 1:30 and 4:00. What is the best Rafting in Yellowstone, the Gallatin, Snake, or Yellowstone Rivers? Very often rafting is the highlight of any vacation to Yellowstone. This is in part because of the three great rivers that run through the national park’s ecosystem. The Gallatin, Snake, and Yellowstone Rivers along with their many tributaries are the heart pumping pathways of this magical environment. They course through some of the most beautiful parts of the park and surrounding valleys. There vital place in this ecosystem makes them centers of geologic history, organic prosperity, wildlife activity, and exploratory travel. You may have experienced the feeling of navigating a rubber raft downhill among, waves, obstacles, and river features while riding an always moving current of last years snow pack before, or you may just think it sounds fun. Regardless, you have some options when vacationing to Yellowstone. As you have no doubt seen and experienced, rivers can vary greatly in their characteristics. Some can be wide, shallow, and meandering like, for example, the large Mississippi, Missouri, and Columbia rivers are, for much of their lengths. Since Yellowstone is so close to the continental divide, area rivers are generally much lower in volume, offer more gradient, and consist of more obstacles than these more eroded cousins. 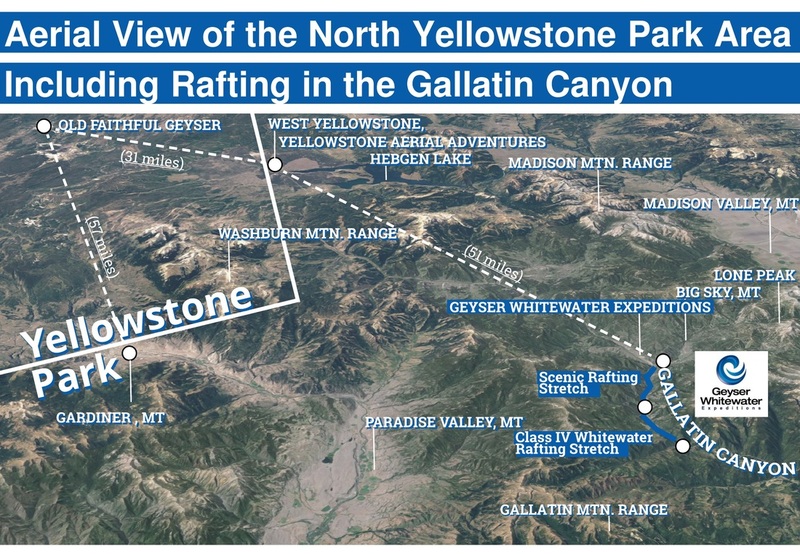 The Gallatin River is the least eroded of the Yellowstone rafting rivers. It’s position in the narrow Gallatin Canyon leaves it loaded with great features that make it not only one of the most popular rivers for whitewater rafting enthusiasts, but also for kayakers and fishermen. Its steep gradient means that there are many places on the river where the water pools up and passes quickly between large boulders and steep banks. It also provides one stretch of the river, often called the “Mad Mile,” where rapids are virtually continuous. The nature of the Gallatin Valley also means that the Gallatin River is relatively low in water volume with many large boulders -- making obstacles that your guide and you will maneuver around in the water. Overall this river’s high gradient, low volume, and many obstacles create a fun and exciting rafting environment that is great for experienced rafters and their families too! The Yellowstone River is one of the larger meandering rivers in the area. It’s headwaters reside inside the national park, the section of the river inside the park offers more gradient, less volume and more obstacles. This would make for a great whitewater adventure, however Yellowstone National Park is the only park in the nation where it is not legal to access the rivers inside the park to float for any reason. Outside the park is a different story! Beginning in the town of Gardiner, MT the Yellowstone River begins to slow down as it hits the wide open Paradise Valley and offers shorter sections of rapids separated by large slow pools of water. The waves found in these rapids can get your whole boat wet, but may leave you wanting more. The Snake River, like the Yellowstone is a relatively high volume river. Unlike the Yellowstone it begins meandering through the wide open expanse of Teton Valley before it regroups and flows through the steeper Alpine Canyon. This gives the run a fair amount of gradient as it goes through the canyon. There are some good quality rapids on the run that can get your boat wet or maybe even flip it over! The large amount of water that flows through the canyon means that it is pretty well eroded and most of the obstacles are cleared out, leaving your raft crew with little to do. Just make sure your guide can keep you in the middle of the river and point you at the waves! You will have a great time on the river! But we can help!! 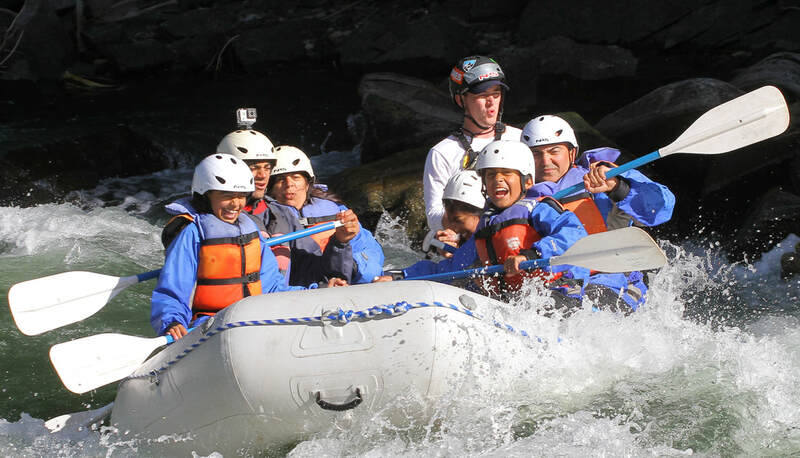 No matter which Yellowstone whitewater rafting trip you go on, you are sure to have a great time! You can’t go wrong in such an amazing place as long as you respect the river, listen to your professional guide and make sure to smile when you get your picture taken! If you have any further questions about how to book a raft trip, or have more questions about the river options and stretches that would be the most fun for your group, feel free to give us a call at: 406-995-4989 or email at whitewater@raftmontana.com. Our passionate river staff will be glad to help.